Spring will be here before we know it! And in anticipation, RJS Craft Winemaking are pairing 3 fresh salads with some of our exceptional En Primeur Winery Series wines for a delightful wake up to warmer weather! Enjoy these delicious recipes and pairings – cheers! 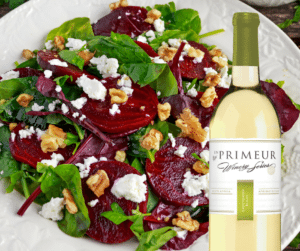 Nothing brings out the tasting notes of our En Primeur South Africa Sauvignon Blanc better than fresh spring greens, goat cheese, beets and pumpkin seeds! Yum! Wash beets and place them in an ovenproof dish. Add one inch of water to the bottom of the dish and cover. Roast until the beets are slightly soft to the touch, 30 to 40 minutes. Cut beets into bite-size chunks and add to a medium mixing bowl. In a small bowl, whisk together oil, dijon, vinegar, salt, pepper, and garlic. Pour dressing over the beets and stir in the pumpkin seeds. Roughly chop the Bibb lettuce and divide among six small plates. Top each plate with the roasted beet mixture (be sure to spoon up the extra dressing at the bottom of the bowl) and then crumble the goat cheese on top. If a crunchier texture is preferred, consider adding roughly chopped walnuts on top. 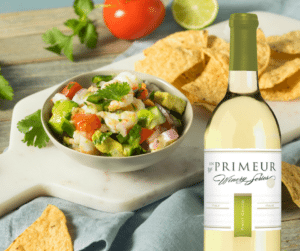 Enjoy a light but delicious shrimp ceviche with our En Primeur Italy Pinot Grigio. The light citrus flavour of the wine will pair perfectly with the sweetness of the shrimp! Fill a large pot with 1 quart water. Cut 4 limes in half, and squeeze their juice into pot; add lime halves. Bring to a boil, then turn off heat; let mixture steep about 10 minutes. Return to a boil. Add shrimp to pot. As soon as water returns to a rolling boil, pour shrimp mixture into a colander; discard cooking liquid and limes. Return shrimp to pot; cover, and let stand 15 minutes. Transfer shrimp to a baking sheet and spread them out; let stand until cool enough to handle. Peel and devein shrimp, and cut into thirds. Transfer to a medium bowl; stir in 1/4 cup lime juice and the scallions, chiles, vinegar, thyme, and oregano. Let stand at room temperature 1 hour, stirring occasionally. When ready to serve, stir avocados, cilantro, and salt into shrimp mixture. Serve with tortilla chips. 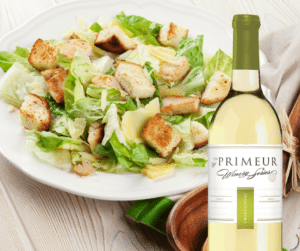 Our En Primeur Chile Chardonnay pairs best with creamy dressings, and who doesn’t love a delicious Caesar salad? !